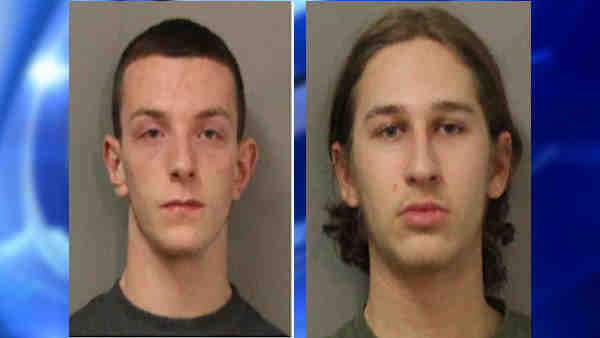 UNIONDALE, Long Island (WABC) -- Police have arrested two teenagers after a brick-tossing incident on the Meadowbrook Parkway last week. Andrew Denton, 17, of East Meadow, and Jacob Palant, 19, of Syosset, were arrested and scheduled to be arraigned Saturday. The incident happened at about 8 p.m. Dec. 26 from the overpass at Kellenberg High School in Uniondale. Two vehicles reported being struck; a 2015 Jeep and a 1996 BMW sustained damage totaling over $1,500 each. A 21-year-old man from Island Park who was driving the BMW, was hit in the right shoulder, but he declined medical attention. The front-seat passenger, a 22-year-old woman from West Hempstead, sustained a glass-related injury to her left eye and her mouth was bruised. She received hospital treatment. Denton and Palant were charged with reckless endangerment, assault and criminal mischief. Piles of bricks were found nearby. Officials said this isn't the first incident like this in the area.